E-waste or electronic waste is created when an electronic product is discarded after the end of its useful life. The rapid expansion of technology means that a very large amount of e-waste is created every minute. 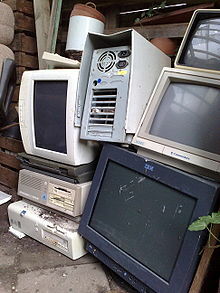 Electronic waste or e-waste may be defined as discarded computers, office electronic equipment, entertainment device electronics, mobile phones, television sets, and refrigerators. This includes used electronics which are destined for reuse, resale, salvage, recycling, or disposal as well as re-usables (working and repairable electronics) and secondary scraps (copper, steel, plastic, etc.). The term "waste" is reserved for residue or material which is dumped by the buyer rather than recycled, including residue from reuse and recycling operations, because loads of surplus electronics are frequently commingled (good, recyclable, and non-recyclable). Several public policy advocates apply the term "e-waste" and "e-scrap" broadly to all surplus electronics. Cathode ray tubes (CRTs) are considered one of the hardest types to recycle. CRTs have a relatively high concentration of lead and phosphors (not to be confused with phosphorus), both of which are necessary for the display. 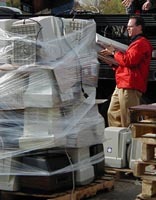 The United States Environmental Protection Agency (EPA) includes discarded CRT monitors in its category of "hazardous household waste" but considers CRTs that have been set aside for testing to be commodities if they are not discarded, speculatively accumulated, or left unprotected from weather and other damage. These CRT devices are often confused between the DLP Rear Projection TV, both of which have a different recycling process due to the materials of which they are composed. The EU and its member states operate a system via the European Waste Catalogue (EWC) - a European Council Directive, which is interpreted into "member state law". In the UK, this is in the form of the List of Wastes Directive. However, the list (and EWC) gives a broad definition (EWC Code 16 02 13*) of what is hazardous electronic waste, requiring "waste operators" to employ the Hazardous Waste Regulations (Annex 1A, Annex 1B) for refined definition. Constituent materials in the waste also require assessment via the combination of Annex II and Annex III, again allowing operators to further determine whether a waste is hazardous. The high value of the computer recycling subset of electronic waste (working and reusable laptops, desktops, and components like RAM) can help pay the cost of transportation for a larger number of worthless pieces than what can be achieved with display devices, which have less (or negative) scrap value. In A 2011 report, "Ghana E-Waste Country Assessment", found that of 215,000 tons of electronics imported to Ghana, 30% were brand new and 70% were used. Of the used product, the study concluded that 15% was not reused and was scrapped or discarded. This contrasts with published but uncredited claims that 80% of the imports into Ghana were being burned in primitive conditions. A fragment of a discarded circuit board. Rapid changes in technology, changes in media (tapes, software, MP3), falling prices, and planned obsolescence have resulted in a fast-growing surplus of electronic waste around the globe. Technical solutions are available, but in most cases, a legal framework, a collection, logistics, and other services need to be implemented before a technical solution can be applied. Display units (CRT, LCD, LED monitors), processors (CPU, GPU, or APU chips), memory (DRAM or SRAM), and audio components have different useful lives. Processors are most frequently out-dated (by software no longer being optimized) and are more likely to become "e-waste" while display units are most often replaced while working without repair attempts, due to changes in wealthy nation appetites for new display technology. This problem could potentially be solved with modular smartphones or Phonebloks. These types of phones are more durable and have the technology to change certain parts of the phone making them more environmentally friendly. Being able to simply replace the part of the phone that is broken will reduce e-waste. An estimated 50 million tons of E-waste are produced each year. The USA discards 30 million computers each year and 100 million phones are disposed of in Europe each year. The Environmental Protection Agency estimates that only 15–20% of e-waste is recycled, the rest of these electronics go directly into landfills and incinerators. In 2006, the United Nations estimated the amount of worldwide electronic waste discarded each year to be 50 million metric tons. According to a report by UNEP titled, "Recycling – from E-Waste to Resources," the amount of e-waste being produced – including mobile phones and computers – could rise by as much as 500 percent over the next decade in some countries, such as India. The United States is the world leader in producing electronic waste, tossing away about 3 million tons each year. China already produces about 2.3 million tons (2010 estimate) domestically, second only to the United States. And, despite having banned e-waste imports, China remains a major e-waste dumping ground for developed countries. Society today revolves around technology and by the constant need for the newest and most high-tech products we are contributing to a mass amount of e-waste. Since the invention of the iPhone, cell phones have become the top source of e-waste products because they are not made to last more than two years. Electrical waste contains hazardous but also valuable and scarce materials. Up to 60 elements can be found in complex electronics. As of 2013, Apple has sold over 796 million iDevices (iPod, iPhone, iPad). Cell phone companies make cell phones that are not made to last so that the consumer will purchase new phones. Companies give these products such short lifespans because they know that the consumer will want a new product and will buy it if they make it. [better source needed] In the United States, an estimated 70% of heavy metals in landfills comes from discarded electronics. One theory is that increased regulation of electronic wastes and concern over the environmental harm in nature economies creates an economic disincentive to remove residues prior to export. Critics of trade in used electronics maintain that it is still too easy for brokers calling themselves recyclers to export unscreened electronic waste to developing countries, such as China, India and parts of Africa, thus avoiding the expense of removing items like bad cathode ray tubes (the processing of which is expensive and difficult). The developing countries have become toxic dump yards of e-waste. Developing countries receiving foreign e-waste often go further to repair and recycle forsaken equipment. Yet still 90% of e-waste ended up in landfills in developing countries in 2003. Proponents of international trade point to the success of fair trade programs in other industries, where cooperation has led to creation of sustainable jobs and can bring affordable technology in countries where repair and reuse rates are higher. Defenders of the trade[who?] in used electronics say that extraction of metals from virgin mining has been shifted to developing countries. Recycling of copper, silver, gold, and other materials from discarded electronic devices is considered better for the environment than mining. They also state that repair and reuse of computers and televisions has become a "lost art" in wealthier nations and that refurbishing has traditionally been a path to development. South Korea, Taiwan, and southern China all excelled in finding "retained value" in used goods, and in some cases have set up billion-dollar industries in refurbishing used ink cartridges, single-use cameras, and working CRTs. Refurbishing has traditionally been a threat to established manufacturing, and simple protectionism explains some criticism of the trade. Works like "The Waste Makers" by Vance Packard explain some of the criticism of exports of working product, for example, the ban on import of tested working Pentium 4 laptops to China, or the bans on export of used surplus working electronics by Japan. Opponents of surplus electronics exports argue that lower environmental and labour standards, cheap labour, and the relatively high value of recovered raw materials lead to a transfer of pollution-generating activities, such as smelting of copper wire. In China, Malaysia, India, Kenya, and various African countries, electronic waste is being sent to these countries for processing, sometimes illegally. Many surplus laptops are routed to developing nations as "dumping grounds for e-waste". Sacks of waste phones in Agbogbloshie, Ghana. or simply thrown in waste bins (750,000 tons). Six of the many villages in Guiyu specialize in circuit-board disassembly, seven in plastics and metals reprocessing, and two in wire and cable disassembly. Greenpeace, an environmental group, sampled dust, soil, river sediment, and groundwater in Guiyu. They found very high levels of toxic heavy metals and organic contaminants in both places. Lai Yun, a campaigner for the group found "over 10 poisonous metals, such as lead, mercury, and cadmium." Guiyu is only one example of digital dumps but similar places can be found across the world in Nigeria, Ghana, and India. Guiyu is likely one of the oldest and largest informal e-waste recycling sites in the world; however, there are many sites worldwide, including India, Ghana (Agbogbloshie), Nigeria, and the Philippines. Most research involving informal e-waste recycling has been done in Guiyu, but there are a handful of studies that describe exposure levels in e-waste workers, the community, and the environment. For example, locals and migrant workers in Delhi, a northern union territory of India, scavenge discarded computer equipment and extract base metals using toxic, unsafe methods. Bangalore, located in southern India, is often referred as the "Silicon Valley of India" and has a growing informal e-waste recycling sector. A studies found that e-waste workers in the slum community had higher levels of V, Cr, Mn, Mo, Sn, Tl, and Pb than workers at an e-waste recycling facility. A separate study at the Agbogbloshie e-waste dump, Ghana found a presence of lead levels as high as 18,125 ppm in the soil. US EPA standard for lead in soil in play areas is 400 ppm and 1200 ppm for non-play areas. Scrap workers at the Agbogbloshie e-waste dump regularly burn electronic components and auto harness wires for copper recovery, releasing toxic chemicals like lead, dioxins and furans into the environment. Computer wires Open burning and stripping to remove copper PAHs released into air, water, and soil. E-waste presents a potential security threat to individuals and exporting countries. Hard drives that are not properly erased before the computer is disposed of can be reopened, exposing sensitive information. Credit card numbers, private financial data, account information, and records of online transactions can be accessed by most willing individuals. Organized criminals in Ghana commonly search the drives for information to use in local scams. Electronic files about government contracts have been discovered on hard drives found in Agbogbloshie. Multimillion-dollar agreements from United States security institutions such as the Defense Intelligence Agency (DIA), the Transportation Security Administration, and Homeland Security have all resurfaced in Agbogbloshie. Recycling is an essential element of e-waste management. Properly carried out, it should greatly reduce the leakage of toxic materials into the environment and mitigate against the exhaustion of natural resources. However, it does need to be encouraged by local authorities and through community education. One of the major challenges is recycling the printed circuit boards from the electronic wastes. The circuit boards contain such precious metals as gold, silver, platinum, etc. and such base metals as copper, iron, aluminum, etc. One way e-waste is processed is by melting circuit boards, burning cable sheathing to recover copper wire and open- pit acid leaching for separating metals of value. Conventional method employed is mechanical shredding and separation but the recycling efficiency is low. Alternative methods such as cryogenic decomposition have been studied for printed circuit board recycling, and some other methods are still under investigation. Properly disposing of or reusing electronics can help prevent health problems, reduce greenhouse-gas emissions, and create jobs. Reuse and refurbishing offer a more environmentally friendly and socially conscious alternative to downcycling processes. A campaign to promote e-waste recycling in Ghana. The U.S. Environmental Protection Agency encourages electronic recyclers to become certified by demonstrating to an accredited, independent third party auditor that they meet specific standards to safely recycle and manage electronics. This should work so as to ensure the highest environmental standards are being maintained. Two certifications for electronic recyclers currently exist and are endorsed by the EPA. Customers are encouraged to choose certified electronics recyclers. Responsible electronics recycling reduces environmental and human health impacts, increases the use of reusable and refurbished equipment and reduces energy use while conserving limited resources. The two EPA-endorsed certification programs are Responsible Recyclers Practices (R2) and E-Stewards. Certified companies ensure they are meeting strict environmental standards which maximize reuse and recycling, minimize exposure to human health or the environment, ensure safe management of materials and require destruction of all data used on electronics. Certified electronics recyclers have demonstrated through audits and other means that they continually meet specific high environmental standards and safely manage used electronics. Once certified, the recycler is held to the particular standard by continual oversight by the independent accredited certifying body. A certification board accredits and oversees certifying bodies to ensure that they meet specific responsibilities and are competent to audit and provide certification. The Sustainable Materials Management Electronic Challenge was created by the United States Environmental Protection Agency (EPA). Participants of the Challenge are manufacturers of electronics and electronic retailers. These companies collect end-of-life (EOL) electronics at various locations and send them to a certified, third-party recycler. Program participants are then able publicly promote and report 100% responsible recycling for their companies. The Electronics TakeBack Coalition is a campaign aimed at protecting human health and limiting environmental effects where electronics are being produced, used, and discarded. The ETBC aims to place responsibility for disposal of technology products on electronic manufacturers and brand owners, primarily through community promotions and legal enforcement initiatives. It provides recommendations for consumer recycling and a list of recyclers judged environmentally responsible. While there have been major benefits from the rise in recycling and waste collection created by producers and consumers, such as valuable materials being recovered and kept away from landfill and incineration, there are still many problems present with the EPR system including “how to ensure proper enforcement of recycling standards, what to do about waste with positive net value, and the role of competition,” (Kunz et al.). Many stakeholders agreed there needs to be a higher standard of accountability and efficiency to improve the systems of recycling everywhere, as well as the growing amount of waste being an opportunity more so than downfall since it gives us more chances to create an efficient system. To make recycling competition more cost-effective, the producers agreed that there needs to be a higher drive for competition because it allows them to have a wider range of producer responsibility organizations to choose from for e-waste recycling. The Certified Electronics Recycler program for electronic recyclers is a comprehensive, integrated management system standard that incorporates key operational and continual improvement elements for quality, environmental and health and safety performance. The grassroots Silicon Valley Toxics Coalition promotes human health and addresses environmental justice problems resulting from toxins in technologies. The World Reuse, Repair, and Recycling Association (wr3a.org) is an organization dedicated to improving the quality of exported electronics, encouraging better recycling standards in importing countries, and improving practices through "Fair Trade" principles. Take Back My TV is a project of The Electronics TakeBack Coalition and grades television manufacturers to find out which are responsible, in the coalition's view, and which are not. There have also been efforts to raise awareness of the potentially hazardous conditions of the dismantling of e-waste in American prisons. The Silicon Valley Toxics Coalition, prisoner-rights activists, and environmental groups released a Toxic Sweatshops report that details how prison labor is being used to handle e-waste, resulting in health consequences among the workers. These groups allege that, since prisons do not have adequate safety standards, inmates are dismantling the products under unhealthy and unsafe conditions. One of the factors which exacerbate the e-waste problem is the diminishing lifetime of many electrical and electronic goods. There are two drivers (in particular) for this trend. On the one hand, consumer demand for low cost products mitigates against product quality and results in short product lifetimes. On the other, manufacturers in some sectors encourage a regular upgrade cycle, and may even enforce it though restricted availability of spare parts, service manuals and software updates, or through planned obsolescence. The "Right to Repair" is spearheaded in the US by farmers dissatisfied with non-availability of service information, specialised tools and spare parts for their high-tech farm machinery. But the movement extends far beyond farm machinery with, for example, the restricted repair options offered by Apple coming in for criticism. Manufacturers often counter with safety concerns resulting from unauthorised repairs and modifications. Lead Solder, CRT monitor glass, lead-acid batteries, some formulations of PVC. A typical 15-inch cathode ray tube may contain 1.5 pounds of lead, but other CRTs have been estimated as having up to 8 pounds of lead. Adverse effects of lead exposure include impaired cognitive function, behavioral disturbances, attention deficits, hyperactivity, conduct problems, and lower IQ. These effects are most damaging to children whose developing nervous systems are very susceptible to damage caused by lead, cadmium, and mercury. Mercury Found in fluorescent tubes (numerous applications), tilt switches (mechanical doorbells, thermostats), and ccfl backlights in flat screen monitors. Health effects include sensory impairment, dermatitis, memory loss, and muscle weakness. Exposure in-utero causes fetal deficits in motor function, attention, and verbal domains. Environmental effects in animals include death, reduced fertility, and slower growth and development. Polyvinyl chloride (PVC) Commonly found in electronics and is typically used as insulation for electrical cables. In the manufacturing phase, toxic and hazardous raw material, including dioxins are released. PVC such as chlorine tend to bioaccumulate. Over time, the compounds that contain chlorine can become pollutants in the air, water, and soil. This poses a problem as human and animals can ingest them. Additionally, exposure to toxins can result in reproductive and developmental health effects. Residents living around the e-waste recycling sites, even if they do not involve in e-waste recycling activities, can also face the environmental exposure due to the food, water, and environmental contamination caused by e-waste, because they can easily contact to e-waste contaminated air, water, soil, dust, and food sources. In general, there are three main exposure pathways: inhalation, ingestion, and dermal contact. Studies show that people living around e-waste recycling sites have a higher daily intake of heavy metals and a more serious body burden. Potential health risks include mental health, impaired cognitive function, and general physical health damage. (See also Electronic waste#Hazardous) DNA damage was also found more prevalent in all the e-waste exposed populations (i.e. adults, children, and neonates) than the populations in the control area. DNA breaks can increase the likelihood of wrong replication and thus mutation, as well as lead to cancer if the damage is to a tumor suppressor gene. Prenatal exposure to e-waste has found to have adverse effects on human body burden of pollutants of the neonates. In Guiyu, one of the most famous e-waste recycling sites in China, it was found that increased cord blood lead concentration of neonates was associated with parents' participation in e-waste recycling processes, as well as how long the mothers spent living in Guiyu and in e-waste recycling factories or workshops during pregnancy. Besides, a higher placental metallothionein (a small protein marking the exposure of toxic metals) was found among neonates from Guiyu as a result of Cd exposure, while the higher Cd level in Guiyu's neonates was related to the involvement in e-waste recycling of their parents. High PFOA exposure of mothers in Guiyu is related to adverse effect on growth of their new-born and the prepotency in this area. Prenatal exposure to informal e-waste recycling can also lead to several adverse birth outcomes (still birth, low birth weight, low Apgar scores, etc.) and longterm effects such as behavioral and learning problems of the neonates in their future life. Children are especially sensitive to e-waste exposure because of several reasons, such as their smaller size, higher metabolism rate, larger surface area in relation to their weight, and multiple exposure pathways (for example, dermal, hand-to-mouth, and take-home exposure). They were measured to have an 8-time potential health risk compared to the adult e-waste recycling workers. Studies have found significant higher blood lead levels (BLL) and blood cadmium levels (BCL) of children living in e-waste recycling area compared to those living in control area. For example, one study found that the average BLL in Guiyu was nearly 1.5 times compared to that in the control site (15.3 ug/dL compared to 9.9 ug/dL), while the CDC of the United States has set a reference level for blood lead at 5 ug/dL. The highest concentrations of lead were found in the children of parents whose workshop dealt with circuit boards and the lowest was among those who recycled plastic. Exposure to e-waste can cause serious health problems to children. Children's exposure to developmental neurotoxins containing in e-waste such as lead, mercury, cadmium, chromium and PBDEs can lead to a higher risk of lower IQ, impaired cognitive function, and other adverse effects. In certain age groups, a decreased lung function of children in e-waste recycling sites has been found. Some studies also found associations between children's e-waste exposure and impaired coagulation, hearing loss, and decreased vaccine antibody tilters in e-waste recycling area. The Occupational Safety & Health Administration (OSHA) has summarized several potential safety hazards of recycling workers in general, such as crushing hazards, hazardous energy released, and toxic metals. Slips, trips, and falls They can happen during collecting and transporting e-wastes. Crushing hazards Workers can be stuck or crushed by the machine or the e-waste. There can be traffic accidents when transporting e-waste. Using machines that have moving parts, such as conveyors and rolling machines can also cause crush accidents, leading to amputations, crushed fingers or hands. Hazardous energy released Unexpected machine startup can cause death or injury to workers. This can happen during the installation, maintenance, or repair of machines, equipment, processes, or systems. Cuts and lacerations Hands or body injuries and eye injuries can occur when dismantling e-wastes that have sharp edges. Noise Working overtime near loud noises from drilling, hammering, and other tools that can make a great noise lead to hearing loss. Toxic chemicals (dusts) Burning e-waste to extract metals emits toxic chemicals (e.g. PAHs, lead) from e-waste to the air, which can be inhaled or ingested by workers at recycling sites. This can lead to illness from toxic chemicals. OSHA has also specified some chemical components of electronics that can potentially do harm to e-recycling workers' health, such as lead, mercury, PCBs, asbestos, refractory ceramic fibers (RCFs), and radioactive substances.Besides, in the United States, most of these chemical hazards have specific Occupational exposure limits (OELs) set by OSHA, National Institute for Occupational Safety and Health (NIOSH), and American Conference of Governmental Industrial Hygienists (ACGIH). For the details of health consequences of these chemical hazards, see also Electronic waste#Electronic waste substances. Informal e-recycling industry refers to small e-waste recycling workshops with few (if any) automatic procedures and personal protective equipment (PPE). On the other hand, formal e-recycling industry refers to regular e-recycling facilities sorting materials from e-waste with automatic machinery and manual labor, where pollution control and PPE are common. Sometimes formal e-recycling facilities dismantle the e-waste to sort materials, then distribute it to other downstream recycling department to further recover materials such as plastic and metals. The health impact of e-waste recycling workers working in informal industry and formal industry are expect to be different in the extent. Studies in three recycling sites in China suggest that the health risks of workers from formal e-recycling facilities in Jiangsu and Shanghai were lower compared to those worked in informal e-recycling sites in Guiyu. In another study of e-waste recycling in India, hair samples were collected from workers at an e-waste recycling facility and an e-waste recycling slum community (informal industry) in Bangalore. Levels of V, Cr, Mn, Mo, Sn, Tl, and Pbwere significantly higher in the workers at the e-waste recycling facility compared to the e-waste workers in the slum community. However, Co, Ag, Cd, and Hglevels were significantly higher in the slum community workers compared to the facility workers. Even in formal e-recycling industry, workers can be exposed to excessive pollutants. Studies in the formal e-recycling facilities in France and Sweden found workers' overexposure (compared to recommended occupational guidelines) to lead, cadmium, mercury and some other metals, as well as BFRs, PCBs, dioxin and furans. Workers in formal industry are also exposed to more brominated flame-retardants than reference groups. For occupational health and safety of e-waste recycling workers, both employers and workers should take actions. Suggestions for the e-waste facility employers and workers given by California Department of Public Health are illustrated in the graphic. a written document about injury and illness prevention. share experience of how to work safely with new workers. provide tools to dismantle the e-waste. provide workers with blood lead testing when lead level is not less than 30 mg/m3. use respirator, check for leaks every time before use, always keep it on your face in the respirator use area, and clean it properly after use. Cuts and lacerations Protective equipment such as gloves, masks and eye protection equipments should be provided to workers When dealing with glass or shredding materials, protect the hands and arms using special gloves and oversleeves. provide workers with earmuffs when necessary. Wear the hearing protection all the time when working. Ask for the employer about the noise monitoring results. Test the hearing ability. Lifting injuries Provide facilities to lift or move the e-waste and adjustable work tables. When handling e-waste, try to decrease the load per time. Try to get help from other workers when lifting heavy or big things. ^ Sakar, Anne. "Dad brought home lead, kids got sick". Archived from the original on 17 March 2016. ^ a b : Sthiannopkao S, Wong MH. (2012) Handling e-waste in developed and developing countries: Initiatives, practices, and consequences. Sci Total Environ. ^ "E-Waste Management and Recycling Programme by Lava mobiles". www.lavamobiles.com. Retrieved 2018-01-29. ^ "WEEE CRT and Monitor Recycling". Executiveblueprints.com. 2 August 2009. Archived from the original on 22 December 2012. Retrieved 8 November 2012. ^ a b Morgan, Russell (21 August 2006). "Tips and Tricks for Recycling Old Computers". SmartBiz. Archived from the original on 15 April 2009. Retrieved 17 March 2009. ^ "Defining & categorization of wastes via the regulations". ITGreen. 2 June 2013. Archived from the original on 11 June 2013. Retrieved 21 June 2013. ^ "Ghana e-Waste Country Assessment" (PDF). SBC e-Waste Africa Project. Archived from the original (PDF) on 15 August 2011. Retrieved 29 August 2011. ^ , Smedley, Tim. The Guardian, 2013. Web. 22 May 2015. Smedley, Tim (18 November 2013). "Is Phonebloks really the future of sustainable smartphones?". The Guardian. Archived from the original on 21 December 2016. Retrieved 19 December 2016. ^ "Statistics on the Management of Used and End-of-Life Electronics". US Environmental Protection Agency. Archived from the original on 5 February 2012. Retrieved 13 March 2012. ^ "Environment". ECD Mobile Recycling. Archived from the original on 24 April 2014. Retrieved 24 April 2014. ^ Blau, J (November 2006). "UN Summit on e-waste: Nokia, Vodaphone and Others to Attend UN Summit on e-waste". CIO business magazine. ^ Section, United Nations News Service (22 February 2010). "As e-waste mountains soar, UN urges smart technologies to protect health". United Nations-DPI/NMD – UN News Service Section. Archived from the original on 24 July 2012. Retrieved 12 March 2012. ^ a b "Urgent need to prepare developing countries for surges in E-Waste". Archived from the original on 31 May 2011. ^ Luthar, Breda. "Class, Cultural Capital, and the Mobile Phone." JSTOR. Web. 22 May 2015. .
^ "E-Waste: How the New IPad Adds to Electronic Garbage." Science Space EWaste How the New IPad Adds to Electronic Garbage Comments. 2014. Web. 22 May 2015. ^ Kozlan, Melanie (2 November 2010). "What is 'E-Waste' & How Can I Get Rid of It?!". Four Green Steps. Archived from the original on 30 November 2010. ^ "Poison PCs and toxic TVs" (PDF). Archived (PDF) from the original on 20 May 2011. ^ Ingenthron, Robin (31 March 2011). "Why We Should Ship Our Electronic "waste" to China and Africa". [Motherboard.tv]. Archived from the original on 21 July 2011. ^ Grossman, Elizabeth (10 April 2006). "Where computers go to die – and kill (4/10/2006)". Salon.com. Retrieved 8 November 2012. ^ a b Osibanjo, Oladele (December 1, 2007). "The Challenge of Electronic Waste (E-waste) Management in Developing Countries". Waste Management & Research. 25 (6): 489–501. doi:10.1177/0734242x07082028. ^ Prashant, Nitya (20 August 2008). "Cash For Laptops Offers 'Green' Solution for Broken or Outdated Computers". Green Technology. Norwalk, Connecticut: Technology Marketing Corporation. Archived from the original on 19 January 2010. Retrieved 17 March 2009. In "CELL PHONE DISPOSAL AND STRATEGIC EVALUATION OF ELECTRONIC WASTE MANAGEMENT IN KENYA, A CASE OF MOBILE PHONE DEALERS IN KISUMU COUNTY" (PDF). European Centre for Research, Training and Development UK. December 2013. Archived (PDF) from the original on 18 May 2015. ^ a b Basel Action Network; Silicon Valley Toxics Coalition (25 February 2002). "Exporting Harm: The High-Tech Trashing of Asia" (PDF). Seattle and San Jose. Archived (PDF) from the original on 9 March 2008. ^ Chea, Terence (18 November 2007). "America Ships Electronic Waste Overseas". Associated Press. Archived from the original on 22 December 2014. ^ Slade, Giles (2006). "Made To Break: Technology and Obsolescence in America". Harvard University Press. Archived from the original on 22 December 2012. ^ a b Carroll (January 2008). "High-Tech Trash". National Geographic Magazine Online. Archived from the original on 2 February 2008. ^ "Product or Waste? Importation and End-of-Life Processing of Computers in Peru", Ramzy Kahhat and Eric Williams, Center for Earth Systems Engineering and Management, Arizona State University, published Environmental Science and Technology June 2009. ^ Minter, Adam (7 March 2011). "Shanghai Scrap". Wasted 7/7. The Atlantic. Archived from the original on 23 March 2011. Retrieved 7 March 2011. ^ "Illegal e-waste exposed". Greenpeace International. Archived from the original on 11 July 2008. ^ "E-Trash Industry Poses Hazards to Workers". Archived from the original on 21 September 2008. ^ Simmons, Dan (14 October 2005). "British Broadcasting Corporation". BBC News. Archived from the original on 28 December 2006. Retrieved 3 January 2010. ^ "Electronic Waste in Ghana". YouTube. Archived from the original on 12 October 2016. ^ "Poisoning the poor – Electronic Waste in Ghana". Greenpeace International. Archived from the original on 8 August 2008. ^ "British Broadcasting Corporation". BBC News. 5 August 2008. Archived from the original on 18 February 2009. Retrieved 3 January 2010. ^ "British Broadcasting Corporation". BBC News. 27 November 2006. Archived from the original on 27 August 2010. Retrieved 3 January 2010. ^ Carney, Liz (19 December 2006). "British Broadcasting Corporation". BBC News. Archived from the original on 21 August 2009. Retrieved 3 January 2010. ^ "Electronic Waste: High-impact Strategies". Archived from the original on 1 December 2017. ^ Slade, Giles. "Computer age leftovers". Denver Post. Archived from the original on 8 December 2006. Retrieved 13 November 2006. ^ Wong, M.H. (2007). "Export of toxic chemicals - A review of the case of uncontrolled electronic-waste recycling". Environmental Pollution. 149 (2): 131–140. doi:10.1016/j.envpol.2007.01.044. PMID 17412468. ^ "Electronic Waste Dump of the World". Sometimes-interesting.com. Archived from the original on 25 November 2012. Retrieved 23 November 2012. ^ "E-Waste Dump of the World". Seattletimes.com. Archived from the original on 21 December 2012. Retrieved 23 November 2012. ^ "Where does e-waste end up?". Greenpeace. Archived from the original on 29 July 2015. ^ Mukherjee, Rahul (2017). "Anticipating Ruinations: Ecologies of 'Make Do' and 'Left With'". Journal of Visual Culture. 16 (3): 287–309. doi:10.1177/1470412917740884. ^ Ngoc Ha, Nguyen; Agusa, Tetsuro; Ramu, Karri; Phuc Cam Tu, Nguyen; Murata, Satoko; Bulbule, Keshav A.; Parthasaraty, Peethmbaram; Takahashi, Shin; Subramanian, Annamalai; Tanabe, Shinsuke (2009). "Contamination by trace elements at e-waste recycling sites in Bangalore, India". Chemosphere. 76: 9–15. doi:10.1016/j.chemosphere.2009.02.056. ^ Needhidasan, S; Samuel, M; Chidambaram, R (2014). "Electronic waste- an emerging threat to the environment of urban India". Journal of Environmental Health Science & Engineering. 12: 36. doi:10.1186/2052-336X-12-36. PMC 3908467. PMID 24444377. ^ Caravanos, Jack (January 2013). "Exploratory Health Assessment of Chemical Exposures at E-Waste Recycling and Scrapyard Facility in Ghana". Journal of Health & Pollution. 3 (4): 11–22. doi:10.5696/2156-9614-3.4.11. ^ "Lead Toxicity: What Are U.S. Standards for Lead Levels?". Agency for Toxicology Substances & Disease Registry. Retrieved 12 January 2019. ^ Chasant, Muntaka (9 December 2018). "Videos and Photos of Agbogbloshie, Ghana". ATC MASK. Retrieved 13 January 2019. ^ "Poisoning the poor – Electronic Waste in Ghana". GREENPEACE. 5 August 2008. Retrieved 13 January 2019. ^ Wath, S. B., Dutt, P. S., & Chakrabarti, T. (2011). E-Waste scenario in India, its management and implications. Environmental Monitoring and Assessment, pp. 172, 249–262. ^ a b "Africa’s Agbogbloshie Market Is a Computer Graveyard" Archived 27 August 2017 at the Wayback Machine NewsBreakingOnline.com. Web. 20 February 2011. ^ Doctorow, Cory. "Illegal E-waste Dumped in Ghana Includes Unencrypted Hard Drives Full of US Security Secrets." Archived 18 October 2012 at the Wayback Machine Boing Boing. 25 June 2009. Web. 15 March 2011. ^ Yuan, C.; Zhang, H. C.; McKenna, G.; Korzeniewski, C.; Li, J. (2007). "Experimental Studies on Cryogenic Recycling of Printed Circuit Board". International Journal of Advanced Manufacturing Technology. 34 (7–8): 657–666. doi:10.1007/s00170-006-0634-z. ^ Fela, Jen (April 2010). "Developing countries face e-waste crisis". Frontiers in Ecology and the Environment. 8 (3): 117. doi:10.1890/1540-9295-8.3.116. JSTOR 20696446. ^ "Data Destruction". www.pureplanetrecycling.co.uk. Archived from the original on 18 May 2015. Retrieved 9 May 2015. ^ "E-cycling certification". Environmental Protection Agency. 2013. Archived from the original on 12 April 2013. ^ "Best Buy Recycles". Bestbuy.com. 2013. Archived from the original on 26 March 2013. ^ "Staples recycling and eco-stapling". Staples.com. 2013. Archived from the original on 18 March 2013. ^ "CEA – eCycle". ce.org. Archived from the original on 6 January 2015. Retrieved 6 January 2015. ^ "Home – Electronics TakeBack Coalition". Electronicstakeback.com. Archived from the original on 26 February 2015. Retrieved 8 November 2012. ^ "How to Find a Responsible Recycler". Electronics TakeBack Coalition. Archived from the original on 8 May 2009. ^ Kunz, Nathan (2018). "Stakeholder Views on Extended Producer Responsibility and the Circular Economy". California Management Review. 60 (3): 45–70. doi:10.1177/0008125617752694. ^ "Default Parallels Plesk Panel Page". Certifiedelectronicsrecycler.com. Archived from the original on 22 December 2012. Retrieved 8 November 2012. ^ "Take Back My TV". ^ "E-waste recycling in U.S. prisons". ^ "40 Million BGN Invested in Bulgaria's 1st Appliances Recycle Plant". Sofia News Agency. 28 June 2010. Archived from the original on 12 October 2012. Retrieved 28 March 2011. ^ "Bulgaria Opens Largest WEEE Recycling Factory in Eastern Europe". Ask-eu.com. 12 July 2010. Archived from the original on 4 September 2011. Retrieved 28 March 2011. ^ "WEEE recycling resources". Simsrecycling.co.uk. Archived from the original on 6 January 2015. Retrieved 6 January 2015. ^ "Benefits of Recycling". hardrawgathering.co.uk. Archived from the original on 6 January 2015. Retrieved 6 January 2015. ^ "What can be recycled from e-waste?". zerowaste.sa.gov.au. Retrieved 29 February 2016. ^ "How to Print 3D Parts Better". sustainabilityworkshop.autodesk.com. Archived from the original on 27 February 2016. Retrieved 29 February 2016. ^ "Zero or close to zero waste". plasticscribbler.com. Archived from the original on 6 March 2016. Retrieved 29 February 2016. ^ "THE FUTURE OF ELECTRONIC WASTE RECYCLING IN THE UNITED STATES: Obstacles and Domestic Solution" (PDF). sea.columbia.edu/. Archived (PDF) from the original on 3 October 2016. Retrieved 29 February 2016. ^ "Characteristics of E-waste Recycling System in Japan and China" (PDF). workspace.unpan.org. Archived (PDF) from the original on 12 October 2016. Retrieved 29 February 2016. ^ "Getting in a spin: Why washing machines are no longer built to last". BBC News. ^ "The Restart Project". therestartproject.org. ^ "The Guardian: A right to repair: why Nebraska farmers are taking on John Deere and Apple". The Guardian. ^ "Chemical fact sheet: Thallium". Spectrum Laboratories. Archived from the original on 21 February 2008. Retrieved 2 February 2008. ^ a b Hieronymi, Klaus (14 June 2012). E-Waste Management: From Waste to Resource. ISBN 9781136299117. ^ "Americium, Radioactive". TOXNET Toxicology Data Network. Archived from the original on 12 October 2016. ^ a b c d Chen, A.; Dietrich, K. N.; Huo, X.; Ho, S.-M. (2011). "Developmental Neurotoxicants in E-Waste: An Emerging Health Concern". Environmental Health Perspectives. 119 (4): 431–438. doi:10.1289/ehp.1002452. PMC 3080922. PMID 21081302. ^ Chen, Aimin; Dietrich, Kim N.; Huo, Xia; Ho, Shuk-mei (2011-04-01). "Developmental neurotoxicants in e-waste: an emerging health concern". Environmental Health Perspectives. 119 (4): 431–438. doi:10.1289/ehp.1002452. ISSN 1552-9924. PMC 3080922. PMID 21081302. ^ "Question 8" (PDF). Archived (PDF) from the original on 26 March 2009. ^ "Cadmium (Cd) – Chemical properties, Health and Environmental effects". Lenntech.com. Archived from the original on 15 May 2014. Retrieved 2 June 2014. ^ a b Liulin, W., Meiling, H., Jing, A., Yufang, Z., Xuetong, W., Yangjun, W., et al. (2011). The cytotoxic and genetoxic effects of dust and soil samples from E-waste recycling area on L02 cells. Toxicology and Industrial Health, 27 (9), 831–839. ^ Birnbaum, LS; Staskal, DF (2004). "Brominated flame retardants: Cause for concern?". Environmental Health Perspectives. 112: 9–17. doi:10.1289/ehp.6559. PMC 1241790. PMID 14698924. ^ Wu, K.; Xu, X.; Peng, L.; Liu, J.; Guo, Y.; Huo, X. (2012). "Association between maternal exposure to perfluorooctanoic acid (PFOA) from electronic waste recycling and neonatal health outcomes". Environment International. 41: 1–8. doi:10.1016/j.envint.2012.06.018. PMID 22820015. ^ Becker, Greg; Lee, Chris; Lin, Zuchen (July 2005). "Thermal conductivity in advanced chips: Emerging generation of thermal greases offers advantages". Advanced Packaging: 2–4. Archived from the original on 21 June 2000. Retrieved 4 March 2008. ^ "Health Effects". United States Department of Labor. Archived from the original on 12 October 2016. Retrieved 30 October 2016. ^ a b c d Grant, Kristen; Goldizen, Fiona C; Sly, Peter D; Brune, Marie-Noel; Neira, Maria; van den Berg, Martin; Norman, Rosana E (December 2013). "Health consequences of exposure to e-waste: a systematic review". The Lancet Global Health. 1 (6): e350–e361. doi:10.1016/s2214-109x(13)70101-3. ISSN 2214-109X. PMID 25104600. ^ a b c d e Song, Qingbin; Li, Jinhui (January 2015). "A review on human health consequences of metals exposure to e-waste in China". Environmental Pollution. 196: 450–461. doi:10.1016/j.envpol.2014.11.004. ISSN 0269-7491. ^ Li, Yan; Huo, Xia; Liu, Junxiao; Peng, Lin; Li, Weiqiu; Xu, Xijin (2010-08-17). "Assessment of cadmium exposure for neonates in Guiyu, an electronic waste pollution site of China". Environmental Monitoring and Assessment. 177 (1–4): 343–351. doi:10.1007/s10661-010-1638-6. ISSN 0167-6369. ^ Wu, Kusheng; Xu, Xijin; Peng, Lin; Liu, Junxiao; Guo, Yongyong; Huo, Xia (November 2012). "Association between maternal exposure to perfluorooctanoic acid (PFOA) from electronic waste recycling and neonatal health outcomes". Environment International. 48: 1–8. doi:10.1016/j.envint.2012.06.018. ISSN 0160-4120. ^ Xu, Xijin; Yang, Hui; Chen, Aimin; Zhou, Yulin; Wu, Kusheng; Liu, Junxiao; Zhang, Yuling; Huo, Xia (January 2012). "Birth outcomes related to informal e-waste recycling in Guiyu, China". Reproductive Toxicology. 33 (1): 94–98. doi:10.1016/j.reprotox.2011.12.006. ISSN 0890-6238. ^ Bakhiyi, Bouchra; Gravel, Sabrina; Ceballos, Diana; Flynn, Michael A.; Zayed, Joseph (January 2018). "Has the question of e-waste opened a Pandora's box? An overview of unpredictable issues and challenges". Environment International. 110: 173–192. doi:10.1016/j.envint.2017.10.021. ISSN 0160-4120. ^ a b c Huo, X; Peng, L; Xu, X; Zheng, L; Qiu, B; Qi, Z; Zhang, B; Han, D; Piao, Z (July 2007). "Elevated blood lead levels of children in Guiyu, an electronic waste recycling town in China". Environmental Health Perspectives. 115 (7): 1113–7. doi:10.1289/ehp.9697. PMC 1913570. PMID 17637931. ^ Zheng, Liangkai; Wu, Kusheng; Li, Yan; Qi, Zongli; Han, Dai; Zhang, Bao; Gu, Chengwu; Chen, Gangjian; Liu, Junxiao (September 2008). "Blood lead and cadmium levels and relevant factors among children from an e-waste recycling town in China". Environmental Research. 108 (1): 15–20. doi:10.1016/j.envres.2008.04.002. ISSN 0013-9351. ^ "Lead". Centers of Disease Control and Prevention. Archived from the original on 11 September 2017. ^ Chen, Aimin; Dietrich, Kim N.; Huo, Xia; Ho, Shuk-mei (April 2011). "Developmental Neurotoxicants in E-Waste: An Emerging Health Concern". Environmental Health Perspectives. 119 (4): 431–438. doi:10.1289/ehp.1002452. ISSN 0091-6765. PMC 3080922. PMID 21081302. ^ Zeng, Zhijun; Huo, Xia; Zhang, Yu; Xiao, Zhehong; Zhang, Yuling; Xu, Xijin (2018-05-12). "Lead exposure is associated with risk of impaired coagulation in preschool children from an e-waste recycling area". Environmental Science and Pollution Research. 25 (21): 20670–20679. doi:10.1007/s11356-018-2206-9. ISSN 0944-1344. ^ Liu, Yu; Huo, Xia; Xu, Long; Wei, Xiaoqin; Wu, Wengli; Wu, Xianguang; Xu, Xijin (May 2018). "Hearing loss in children with e-waste lead and cadmium exposure". Science of the Total Environment. 624: 621–627. doi:10.1016/j.scitotenv.2017.12.091. ISSN 0048-9697. PMID 29272831. ^ Lin, Xinjiang; Xu, Xijin; Zeng, Xiang; Xu, Long; Zeng, Zhijun; Huo, Xia (January 2017). "Decreased vaccine antibody titers following exposure to multiple metals and metalloids in e-waste-exposed preschool children". Environmental Pollution. 220 (Pt A): 354–363. doi:10.1016/j.envpol.2016.09.071. ISSN 0269-7491. PMID 27692881. ^ a b c "Recycling | Consumer Electronics". www.osha.gov. Retrieved 2018-11-24. ^ "Electronic Waste Recycling: Working Safely" (PDF). ^ "OSHA Occupational Chemical Database | Occupational Safety and Health Administration". www.osha.gov. Retrieved 2018-12-13. ^ a b c d Ceballos, Diana Maria; Dong, Zhao (October 2016). "The formal electronic recycling industry: Challenges and opportunities in occupational and environmental health research". Environment International. 95: 157–166. doi:10.1016/j.envint.2016.07.010. ISSN 0160-4120. PMID 27568575. ^ "ADISA website". Asset Disposal and Information Security Alliance. Archived from the original on 29 May 2015. Retrieved 9 May 2015. Ogunseitan, O.A. ; Schoenung, J.M. ; Saphores, J-D.M. ; Shapiro, A.A. (2009). "The Electronics Revolution: From E-Wonderland to E-Wasteland". Science. 326 (5953): 670–671. doi:10.1126/science.1176929. PMID 19900918. Toxics Link (February 2003). "Scrapping the Hi-tech Myth: Computer waste in India". India. Archived from the original on 19 July 2011. Retrieved 25 March 2011. MOOC: Massive Online Open Course "Waste Management and Critical Raw Materials" on (amongst others) recylcing and reuse of electronics.